A model of President Trump from the Madame Tussauds waxwork museum was brought Friday to the new U.S. Embassy in London's Wandsworth borough. "Trump cancelled his visit so we stepped in!" Madame Tussauds tweeted. Passenger trains pass through Battersea Park rail station as construction work continues on the Battersea Power Station residential and retail development complex in London in December. Real estate agent Jonathan Scobie, who sells property at an apartment complex near the new embassy, says the attention generated by the president's tweet is "only going to help us sell our property down here." Trump was referring to the London borough of Wandsworth, south of the River Thames, which is now home to a massive development known as Nine Elms. Once a logistical hub for distributing fruit and vegetables, among other things, Nine Elms today is dotted with cranes and includes multimillion-dollar waterfront apartments. "I thought he got it wrong," said Ravi Govindia, leader of the Wandsworth Council, referring to Trump's implicit criticism of the area. That may not be the only thing Trump got wrong. The embassy, in fact, cost about $1 billion, according to U.S. government officials. In an extraordinary statement Friday, the embassy effectively defended itself against the president's criticisms. A spokesman said the new embassy was not financed through taxpayer dollars but through a property swap after the old embassy in Mayfair became too rundown and could no longer provide adequate security. "The new Embassy in Nine Elms is one of the most secure, hi-tech, and environmentally-friendly embassies the United States has ever built," the statement said. "We are strongly committed in the Special Relationship between our two countries and we are confident the new Embassy will provide the necessary platform to continue our cooperation." 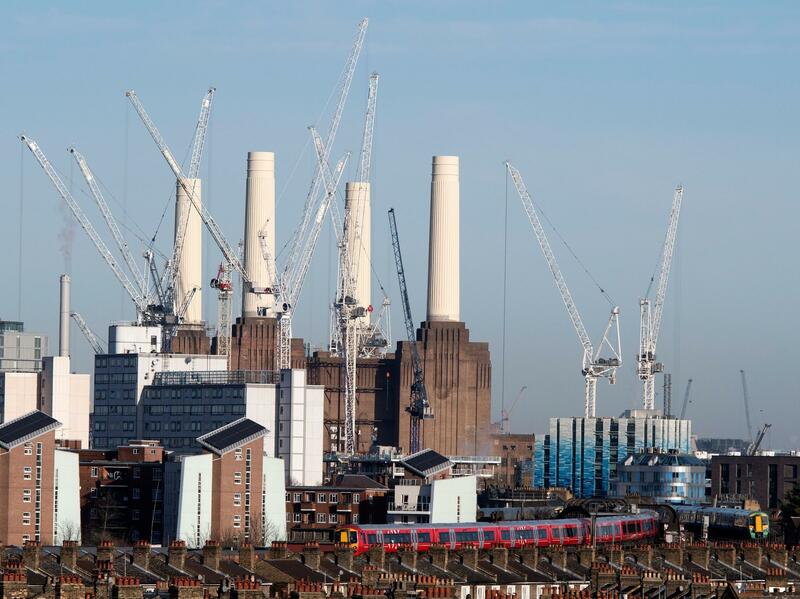 Besides the embassy, the Nine Elms development is anchored by the old Battersea Power station, a red-brick colossus with towering white smokestacks that was famously featured along with a floating pig on the cover of the 1977 Pink Floyd album Animals. After sitting empty for decades, the building — which also served as a shooting location for the 2008 Batman movie, The Dark Knight -- will become home to luxury apartments and Apple's U.K. headquarters. "As a real estate person ... I think [President Trump] would see that there is always an opportunity in regenerating and redeveloping a site," said Govindia. "It may not look great to start with, but it is what you do with it that makes it great and that's where the opportunities and profit are." It's not just government boosters who have nice things to say about the area. Residents are optimistic about its future as well. Saina Behnejad moved into her mother's apartment in Nine Elms last year. The 25-year-old magazine editor says when her mother bought here in the early 2000s, the area was gray and quiet, without tall buildings or many people. Now, she says, Nine Elms — which has two Tube stops coming — feels more vibrant. Behnejad says people in the neighborhood weren't offended by Trump's comments. "We just find it very amusing," she said, standing in front of the embassy. "I just think he probably doesn't know anything about London at all. It's constantly evolving and changing." Not everyone is enamored with Nine Elms. Some find the glass and steel architecture soulless. Since the U.K.'s vote to leave the European Union in 2016, new luxury property in London has seen significant price declines. Last year, Bloomberg reported that sales and falling values in Nine Elms drove some developers to sell units in bulk at a discount. Jonathan Scobie, a real estate agent who sells property at Embassy Gardens, an apartment complex near the embassy, was excited for Trump's planned visit. He is also a big fan of the president and his blunt style. 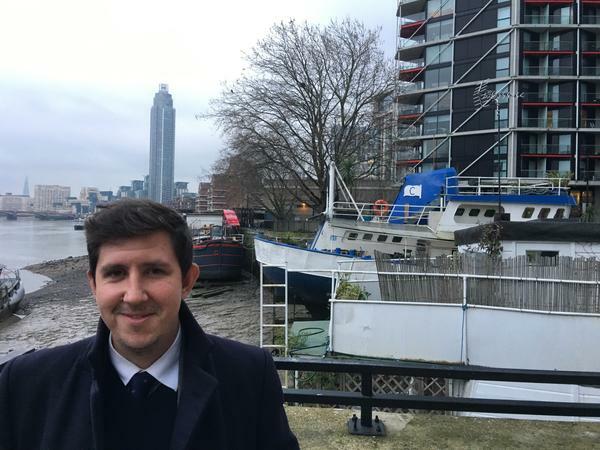 "He speaks his mind and I think that's what the world needs," said Scobie, standing next to some decrepit houseboats beneath a luxury apartment block, which illustrates the area's evolving gentrification. Scobie doesn't agree with Trump's characterization of Nine Elms, but he says the attention generated by his tweet won't hurt. "It's only going to help us sell our property down here," said Scobie, "which is obviously great." President Trump has canceled a planned visit to the United Kingdom to open the new U.S. Embassy there. He says it costs too much. He also says the new embassy is in an off location in contrast to London's prestigious Mayfair district where the old embassy was. NPR's Frank Langfitt reports from the new embassy's neighborhood. 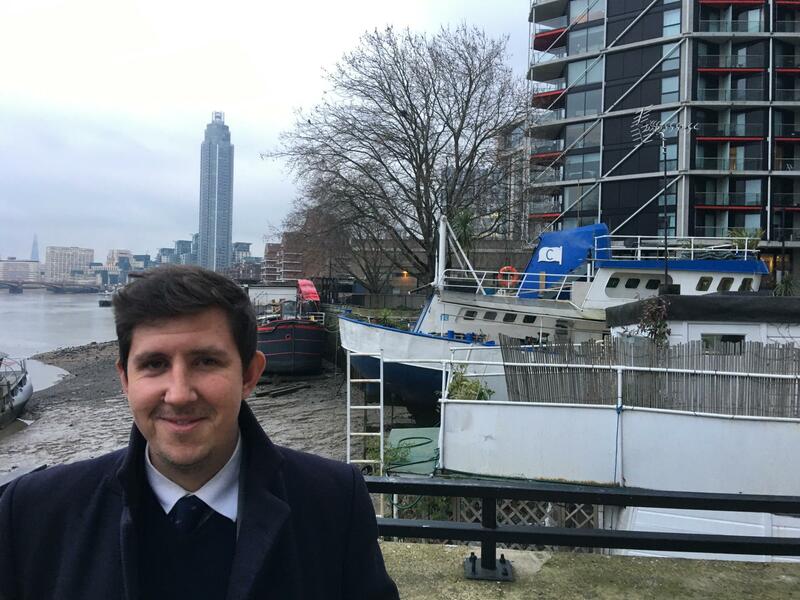 FRANK LANGFITT, BYLINE: John Scobie, a local realtor, is giving me a tour of Nine Elms. That's where the $1 billion U.S. Embassy will open next week. It lies along the south bank of the River Thames, upstream from Big Ben. JONATHAN SCOBIE: The whole site here was originally designed to be based around the American Embassy. And we have beautiful, beautiful apartments right on the edge of the River Thames starting from anywhere from about 500,000 or 600,000 for a one-bed going up to multiples of millions. SCOBIE: You've got the Battersea Power Station development, which is arguably one of the biggest developments in the world at the minute. It's going to - estimated to cost about 8 billion. In 2020, you'll be able to see two new Tube lines opening. LANGFITT: The old power station, a red brick colossus, sat empty for decades. It's now slated to house Apple's U.K. headquarters and luxury apartments. That's a big leap for Nine Elms, which was once famous as London's wholesale market for fruit and vegetables. Today it's dotted with cranes. Scobie's a big fan of President Trump and his blunt style, but he thinks his assessment of this area is off-base. SCOBIE: If he gave me the opportunity, I'm sure I'd be able to sell him a couple of penthouses down here. And I'm surprised he hasn't bought his own plot of land down here 'cause all the other developers have done it. LANGFITT: Residents in the neighborhood took Trump's tweet in stride. SAINA BEHNEJAD: I don't think anyone here's really that offended. We just find it very amusing. LANGFITT: Saina Behnejad is a 25-year-old magazine editor and a fan of the new embassy, a glass and steel cube that shimmers in the sunlight. BEHNEJAD: This building's amazing. I don't know what fault you can find with it. It's just massive. I've never seen an embassy this big before (laughter). So I think he probably doesn't know anything about London at all. LANGFITT: Not everyone, though, is sold on Nine Elms. U.K.'s decision to leave the European Union has helped drive down luxury real estate prices in London. Last year, Bloomberg reported falling values in Nine Elms drove developers to sell units at a discount. Frank Langfitt, NPR News, London. Transcript provided by NPR, Copyright NPR.